Aero modeling is a fascinating hobby and sport among school children for both boys and girls. We all travel by plane but don't know how such a heavy plane with so many passengers and luggage flies so high in the sky facing the winds at very high speed even in bad weathers, during day and night. Children always think and wants to know how aeroplane is flying in the sky? How birds are flying in the sky? Can we also fly or how can we fly? Do we need some wings to be fixed to our body so that we can also fly like birds. All these questions arise in the mind of kids and children, but we have to explain and teach them the principles of flying so that they are no more ignorant about the same and all their doubts are cleared. Our aero modelling programme has been prepared by qualified and experienced aeronautical engineers suitable for young children age 8+ years which is easy to understand and more practical rather than learning theory. 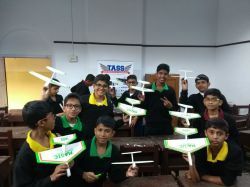 The workshop is dedicated to learn first the aviation history, followed by the basic principles of fying, the technology behind designing of aircrafts along with hands-on experience in construction of your own aero-model and flying. We have experienced and qualified aeronautical engineers as trainers for conducting the workshops. 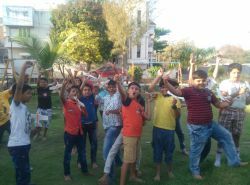 Aero modelling is a well accepted and prescribed co-curriculum activity by CBSE, which a child can pursue in his school hours besides other activities like robotics, electronics etc. These has been designed for age 8+ year and onwards. Aero-modelling world- showing videos about various kinds of aeroplanes used in the world. Distribution of Kits, Introduction to tools, accessories, materials and safety precautions. for more information and clarification.